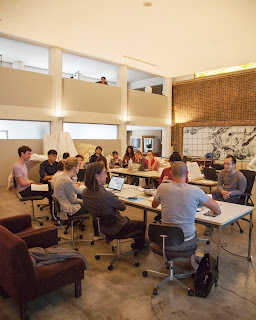 Summer Pavilion Project with Obayashi Co. This year’s G30 Pavilion will be developed as a collaboration project with Obayashi Corporation, one of Japan’s major construction companies. In the past two years, we have built two pavilions at scales that were manageable to G30 students with our limited resources. In order expand our ambitions, we have invited our Digital Fabrication Lab’s sponsors to join our pavilion projects. As a prototype of temporally structures for Tokyo Olympic 2020, four design proposals were developed by G30's 1st year design teams, and one was selected by both G30 teaching staff and members of Obayashi Co to be developed further and to be built this summer. 2. The other one which integrates a degree of tolerance, of loophole, in terms of individual and collective strategy of urban mutation and self‐organization. 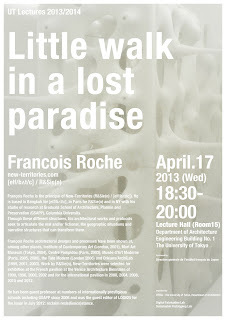 Francois Roche will lecture on Apr. 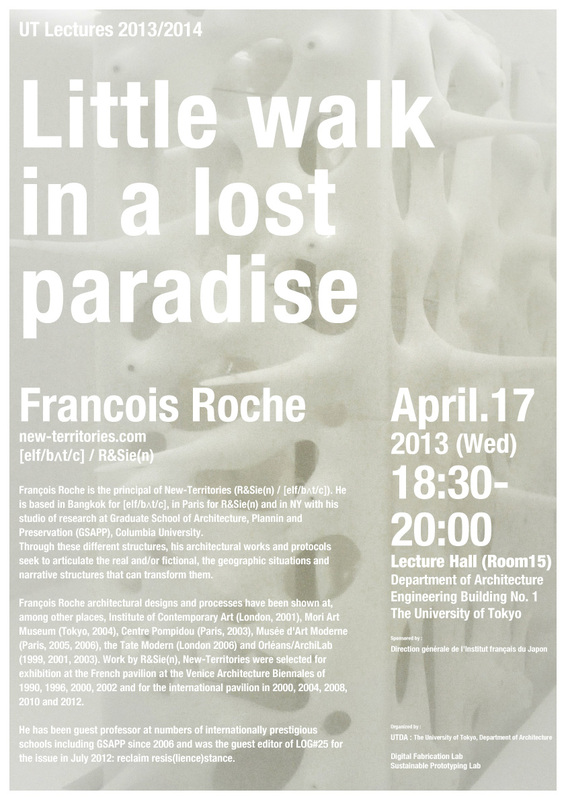 17th at the University of Tokyo. François Roche is the principal of New-Territories (R&Sie(n) / [eIf/bʌt/c]). He is based in Bangkok for [eIf/bʌt/c], in Paris for R&Sie(n) and in NY with his studio of research at Graduate School of Architecture, Plannin and Preservation (GSAPP), Columbia University.